It was not too long ago that MP3 softwares weren’t free. They weren’t free because the format itself has active patents attached to it, and content creators and developers have to pay a price somewhere. Nowadays MP3s are synonymous with the music industry, but the rise of open source formats are changing the underlying cost of content distribution. Everyday users watching videos on YouTube probably doesn’t care too much about the format of the videos they’re watching. The only thing they probably care about is whether or not the video loads. For developers and content distributors, however, it might be a different story. The software they use have attached costs that either hinder the distribution or the quality of the content themselves. One of the rising stars in open source format is .ogg, which is an open container format maintained by the xiph.org foundation. In addition to continual support from developers worldwide, .ogg is unrestricted from software patents so content creators and distributors are free to do as they please. So when developers want to distribute content on the World Wide Web for billions of eyes to view, they should consider using .ogg as the vehicle to do so. Support for the format is so widespread that most popular desktop browsers and mobile platforms are able to take advantage of .ogg. The only thing that needs to be done is converting a non-.ogg format into .ogg. 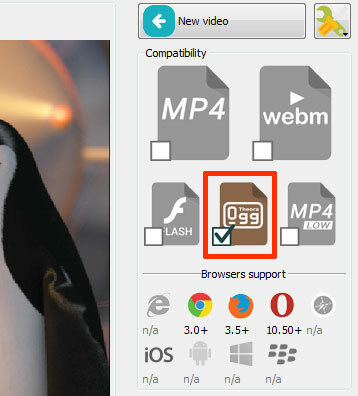 Converting a media format into .ogg isn’t hard, it’s actually as easy as 1, 2, and 3 with a free software called EasyHTML5Video. The software lets you converts 300+ formats into the desired .ogg format for use with HTML5-capable browsers.